The Cleftomaniacs are NYU’s premier all female a cappella group. They are made up of fierce, talented, and chill women from all over. They have a wide range of academic interests from neural science and engineering to musical theater and film. Some of our favorite songs to perform are River (Bishop Briggs), Wannabe (The Spice Girls), Man in the Mirror (Michael Jackson) and more! They are currently recording their fourth album that will be coming out this spring. Everyone in the group truly loves being a part of the Cleftomaniacs. There is as much smiling and laughing at rehearsals as there is singing. As well as being an a cappella group, they are a family. 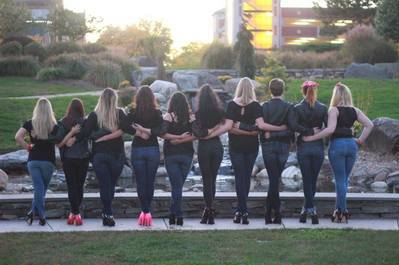 Drop the Bass is the newest all-female a cappella group at the University of Connecticut! They are a community service-focused performance group with the intention of bringing music to those that are not regularly exposed to it and who need it most. Formed in the fall 2013 semester, they plan to perform at nursing homes, hospitals, and schools in the Storrs, Connecticut area. The group is freshmen to seniors with the talent and passion for vocal performance. Empire Broadcast is a quartet that hails from Long Island and they LOVE to ring those chords, old and new. Although together as a group only since last year, its members have been singing close harmony for many years. Their varying backgrounds and experiences help create an ensemble that has begun to make a name for itself in the NYC area and beyond. They will sing just about any place, at any time. Mike, Hal and Ed also sing in the Long Island Sound Chorus in Dix Hills (where Mike is co-director) and Bill is a member of Manhattan's Big Apple Chorus. To contact the quartet, just call (516) 500-1119 or email empirebroadcastquartet@gmail.com. Minnesota State University, Mankato has a long history of prominent contemporary vocal performances in the Midwest and on International tours. MSU groups have evolved from a show choir (in the 70s) to vocal jazz, to contemporary a cappella. Former members have gone on to careers in film, television, theatre, music, and in the world of a cappella, in the NBC Sing-Off winning group, "Home Free". Maverick Vocal Precision, directed by Drs. Douglas Snapp & Stephanie Thorpe, is a regular ensemble in the music department curriculum. Martini Glass A Cappella is an award-winning semi-professional group comprised of ten ladies from the greater Danbury, Connecticut area. Started in 2004 with students from Danbury High School, Martini Glass has been captivating people for almost fifteen years. Their confusing name (according to the group), coupled with a wide range of styles in their repertoire, from jazz and pop to Broadway and rock, ensures there is always something for everyone when they perform. Mezzo is a New York City–based, all-female a cappella group. A couple of us gathered back in 2014 to sing together casually, and with that, Mezzo was born! ​Since then, Mezzo has sung at venues like the Bell House, the Marriott Marquis, the Shrine, Pianos, and Sessions 73, and have also been part of events such as Thanksgiving parties, Halloween celebrations, weddings, and corporate affairs. They're a part of the Contemporary A Cappella League and the MTA's Music Under New York program, and are the official music partner of the Women's Education Project. They are a diverse, close-knit group of women who enjoy each other's company, finding their way through life in this city together! The Riffrunners are the leading co-ed, contemporary a cappella group at Ramapo College in Mahwah, NJ. Since its conception in 2011, every aspect of the group has been managed by the students from business managing to arranging music. They recently hosted an exhilarating workshop with world beatboxing champion Chris Celiz from the beatbox conglomerate Beatbox House (Brooklyn, NY) and are planning similar events at the Ramapo campus! Too Good For Instruments A.K.A TGFI is an all-female a cappella group from Central Connecticut State University in New Britain, CT. TGFI stands for sisterhood, women empowerment, emotional connection, and a genuine passion for music. TGFI has placed 2nd runners up at the ICCA quarterfinals in 2011 and 2012 and 1st place at the Connecticut Collegiate Sing-Off in 2011 and 2012. Additionally, TGFI has placed 1st at the Bijou Blender A Cappella Competition and has been on Fox News! These sisters in pink never fail to deliver, and are sure to be fierce and full of attitude! ​@tgfiacappella at Twitter and Instagram. The Workshop is a New York-based a cappella group spicing up the post-collegiate scene with its alternative style, unique repertoire, and down to earth personalities. Formed in 2012, The Workshop has performed all over NYC at venues including The Bitter End, Arlene's Grocery, The Triad, 54 Below and more. In recent years the group has experienced great success with growing their online presence. Over the last year, they have grown their instagram following to over 8k fans, debuted a viral video of Baby Shark at Walmart in conjunction with Discovery Channels’s Shark Week, and are filming their own web series which will debut later this spring! Currently the group is comprised of working professionals ranging from lawyers and engineers, to entertainment executives and marketers.